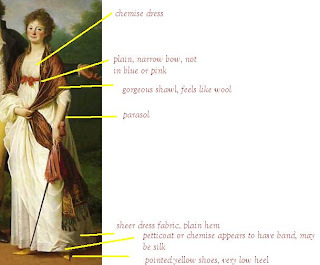 Here is the second part of an examination of 1790s fashion through an unscientific sampling of paintings, prints, and fashion plates. You can read Part 1 here. As always, please click on images to open a larger version. Last time we ended roundabout 1795, when the arts and fashion seriously turned their attention to all things classical. Yet let's consider the takeover of the gathered drawstring neckline some more. First of all, it's good to know that drawstrings had been used on gown necklines before this time. While bodices were tight-fitting during most of the eighteenth century, so that they stretched smoothly over the stays beneath, fit could be achieved with drawstrings as well as with pins. Here's an example from a gorgeous 1770s polonaise dress on for sale at the Antique and Vintage Dress Gallery. In the photo above, the bodice hasn't been fitted to the person...you can see in the other half of the bodice how the fabric straightened out when it was pulled a little to fit over the torso. Here's another photo of the right side, which has been drawn up a little. 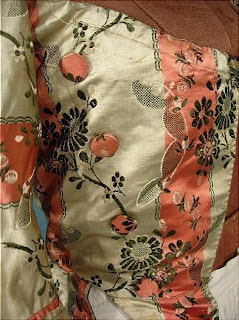 Look very carefully about half an inch below the edge of the silk fabric, and you can see stitching. That marks the outer edge of the channel through which the drawstring is run. One last picture. 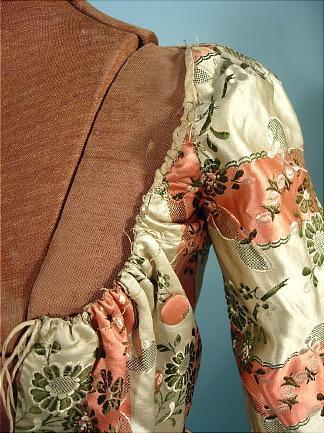 In this one we see the bodice interior. As with gowns of the day it's lined. A channel the drawstring was simply created by running a row of stitching parallel to and a little below the neckline edge, and the drawstring threaded through: no need for a separate casing. Again, if you look extremely carefully, you can see the outline of the drawstring channel. 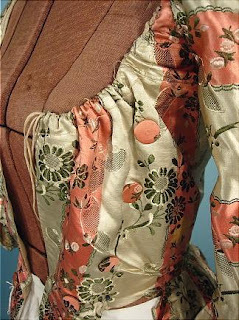 The 1780s...chemise dresses with gathered necklines, and chemises or chemisettes with drawstrings appear to show above round gowns. The Marquise de Pezay's chemise or habit shirt stands out a little on its drawstring so that you can see a portion of the inside as well as the outside. The garment is really heavily gathered, so that would give it some body, but it also appears a bit opaque, so it's not terribly gauzy. 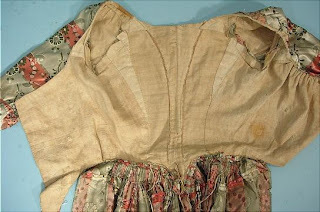 By contrast the Marquise de Rouge is wearing a chemise or habit shirt that is less gathered and sheerer: you can see the casing through which the gathering string is drawn right through the exterior of the garment. I cannot find a really high-resolution version of the picture, but wonder if her dress itself has a gathered neckline, too: the stripes on the bodice do not run vertically, and there is a little bouf right at the center neckline, almost as if there were strings there. 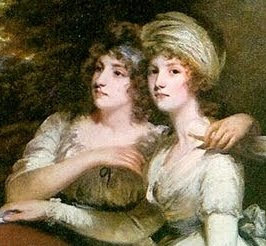 In the early 1790s one of the Falkland sisters (on the left) wears a gathered drawstring chemise dress, with a small frill at the edge. In Spain, a classical take on the chemise dress. The dress gathering runs far out to the shoulders: look to the right of the red bow (marked in image above with second yellow line) and you see gathering. Maria Teresa's hair is covering the left dress strap, so you cannot see that side. The chemise dress patterns in Norah Waugh's Cut of Women's Clothes and in the Everyday Dress of Rural America 1783-1800 do not gather all the way around the neckline. Instead, they gather across the front and then stop at the straps that go over the shoulder. What appears to be a double frill (marked with the top yellow line in the image above) on the dress may be the actual chemise worn under the dress, and then the dress atop. Showing both would have been a neat decorative touch. 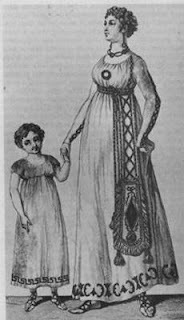 In 1795, the famous Madame Seriziat and her late chemise dress, with the neckline apparently gathered on a drawstring, this time all the way up to shoulder top, at least. It turns out that the dress has a collar and the fashion fabric is mounted to a lining. Still, there is charted draft of a "white cotton gown" from the Williamsburg collection that shows the drawstring treatment. See http://www.19thus.com/WomensClothing/WmburgGown_c_1800.html. 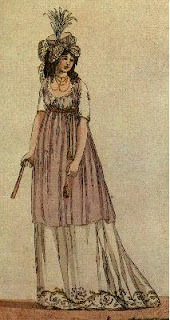 In the early 1790s, round gowns frequently started to feature gathered necklines on drawstrings, too. Round gowns had been around for years, and were so called because the skirts didn't open in front to reveal the petticoat, and the bodice closed in front, requiring no stomacher. The bodices on earlier round gowns didn't show much gathering, but sat close against the stays. 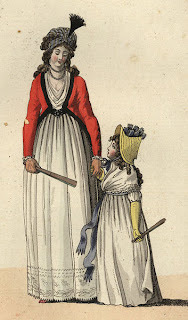 Here are two ladies wearing examples of the gathered style, part of a group in a Cruikshank caricature of 1795. The pictures are fun, but the topic risque, so be forwarned if you visit the original on Wikimedia Commons. Meg Andrews, a well-known textiles dealer, has such a robe on her site (see http://www.meg-andrews.com/item-details/Printed-Open-Robe/6056), and they turn up every so often in collections. It is harder to find clear examples of either the gathered neckline robes or gathered neckline round gowns in paintings. In the fashion plates and paintings available on the web, light-colored muslin dresses predominate over round gowns. Fashion plates showed high fashion, and the light muslins were highest fashion. 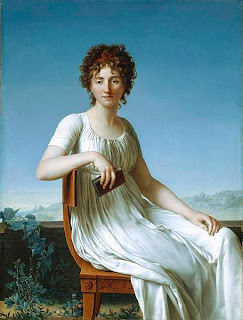 Paintings usually showed sitters at their best, too, and again, it appears as if the "little white dress" was most frequently selected as the dress to be seen in. Of course, this is supposition on my part. We in the 21st century may have created a false representation if we preferred to upload pictures of women in white dresses. Not having access to a full catalog of paintings, I do not know for sure. What is apparent, is that from the mid 1790s onward, the gathered neckline was to predominate over the tightly fitted bodice front, whatever the color or style of dress. In the last post we stopped in 1795 with a print that poked gentle fun at all things classical. In that print, everyone is quite severely dressed...no ruffles or frills there. Now, let's move forward, looking towards the end of the century. Oops, I forgot this one from 1794. 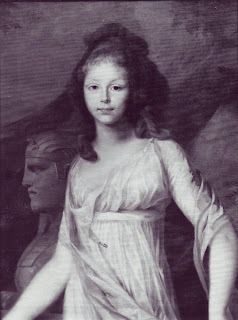 Here is Princess Frederika (image from Costumer's Manifesto), circa 1794. She, like Madame Seriziat, is wearing a very plain chemise dress, decorated at hem probably with embroidery and maybe a ribbon applied, since it's a different color than the main dress fabric. She pulls her dress up to show the slightly shorter petticoat, which is also barely trimmed. 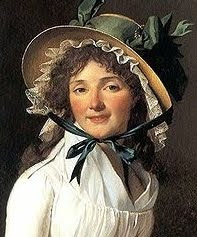 In fashion plates, frills and lace still appeared, although not in quite the profusion they had earlier in the decade. 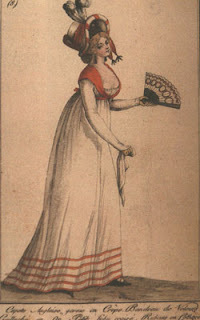 For example, in this 1795 Gallery of Fashion print, if you look carefully, you see a small frill on the neckline of her dress. If you visit Cathy Decker's Gallery of Fashion magazine pages, and look year by year, you will see a slow reduction in frilliness as the years go by. Spotted muslins were fashionable along with the plain white muslins. They are hard to find in exant garments, by the way. That any should survive is amazing, given how light and airy -- and tearable -- the fabric was. You can see two of them in a Cora Ginsburg gallery's 2006 auction catalog, at http://www.coraginsburg.com/catalogues/2006/cat2006pg16&17.htm. For half and full dress, wilk satin was also popular among the upper crust...the fine cottons hadn't quite replaced silks. 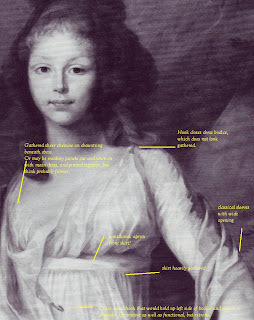 You can see spotted muslin in the Heideloff plate, also from 1795, below; image courtesy Cathy Decker's site. As in the plate above, the neckline is not round, but vee-shaped. This plate features figures wearing the very popular open robes above either round gowns, chemise dresses, wrap-front (with the vee-necklines) dresses, or petticoats, with kerchiefs tucked into the robe. The terms round gown, chemise, robe and petticoat, so long used in the 18th century, continued to be used in the fashion press, and referred to the same articles, even though their designs had morphed so much. Note that fur boas, known as tippets, could replace the long narrow garments that went by the name of cloak in the fashion press, but overall, the idea was to have something long hanging about your neck. Once again, those beads and tall feathers swaying. 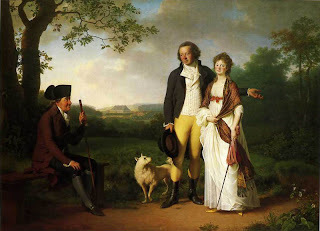 Here is a favorite portrait from Wikimedia Commons, this one of the Ryberg family, in 1796. If that is Mrs. Ryberg, I think she must have been a lovely person; she looks, as they might have said, most amiable. Her dress is impeccable. She is wearing a chemise dress, tied with a very high waistline by a narrow reddish bow that coordinates with her shawl. The bow is simple, not a rosette; I cannot tell for sure but the dress may not have a drawstring at the waist: many did not. The dress is entirely plain so far as the viewer knows, and quite sheer. The petticoat beneath may be silk, for it has a sheen. It may have a band at the bottom. It was fashionable to hold up your dress to show a little of it; paintings and fashion plates make this movement all the time. She is carrying a lovely oblong shawl, with a fancy tied fringe and pretty border, as well as a parasol with a long handle. It looks pinkish and I wonder if it would coordinate or not. Her shoes are in a rich yellow, fashionably pointed and with the barest heel. The shoes coordinate with the yellows in the shawl. She does not wear powder and her hair is more simply coiffed and narrower than earlier in the decade. the metal hooks that close the front of the bodice to the shoulders. This appears then to be a bib-front dress, meaning that the bodice front is not attached to the side panels and must be pinned in place. It's the first I have seen for this year, and I almost wonder about the date the work is attributed to. The waistband so high up, with heavily gathered skirt beneath. The way the bib front is bloused it's hard to tell, but my guess is that the skirt is apron front style, meaning that it is not connected to the bodice. This means that the bodice front is only connected at part of the sides, and the skirt is split at the side seams. The front skirt panel's waistband would end in long ties. The bodice would be pinned in place, then the skirt front panel brought up and the ends be tied in the back. Skirts were still quite full in 1796: as the years went by they became skimpier and flatter in front. There is no sash...sashes begin to drop out of fashion by century's end. The sleeves end in trumpet shapes, longer in back than in front, very Greek statue-ish and not long in fashion. She still has the long locks of the 1790s, unpowdered, not the updos prevalent around 1800. Oh, by the way, she liked fashion. 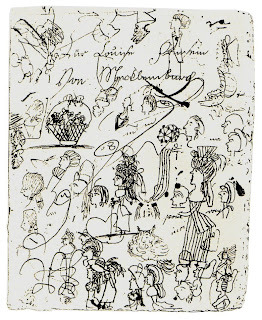 Here are scribblings said to have been done in 1795...and they include a sketch of a lady wearing a zone-front dress, in stripes, along with ladies wearing the wide poufy coiffures that so soon would become history. 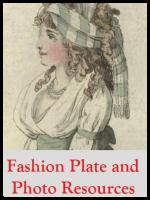 How about some fashion plates for 1796? Here is one from the German-language Journal für Fabrik, Manufaktur, Handlung und Mode. As with Queen Louise's dress, this chemise dress (or petticoat and kerchief combination) lacks any heavy decoration at the neckline. Over it is worn a cross between the open robe and a coat. The dress is still very full in front, but embroidered and van dyked at bottom. Note the pretty doubled strand of beads at the woman's neckline. Another 1796 Heideloff fashion plate. 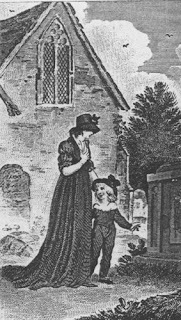 There is the spotted muslin, a few frills, the long cloak dangling, the very high waist and very full skirt and the fashionable pose, negligently pulling up one's skirt with a hand. This year in caricatures is helpful, too. 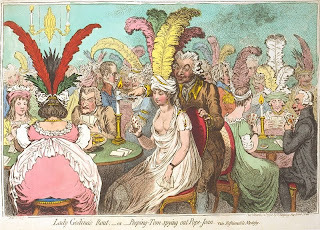 Here is one by James Gillray. I hesitated to show it because it's a bit off-color, but the coiffures and the evening dress, while exaggerated, show very clearly the changes occurring in fashion. The round-figured lady on the left, the Duchess of Buckinghamshire, is wearing a round gown and some sort of overdress, I suppose, the neckline is frilled or ruched with what is likely lace: lace in full dress (evening dress) remained fashionable for many women. The rather undressed lady next to her wears -- or doesn't -- the height of fashion, an extremely classical gown, the chemise dress morphed, with split short sleeves closed with golden jewelry and a turban. No apparent gathering at neckline, as seen in one of the fashion plates for the same year, above. No modest neckerchief for the night hours, either. The lady in green's dress has frills at neckline. Everyone sports the tall feathers so popular in the middle of the decade. 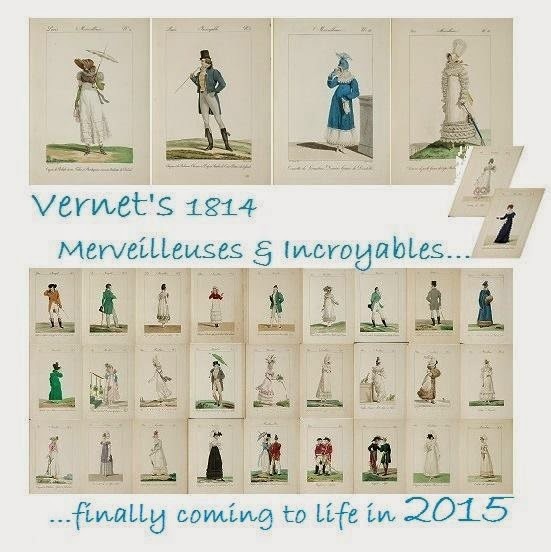 From 1797 through 1800, changes in dress sihouette had slowed just a bit, according to fashion plates I have seen. 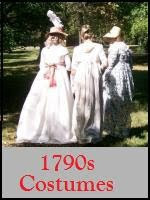 Dresses remained full, if not quite as full as in 1796, spotted muslins and plain muslins still appeared, as did robes. Decoration tended more and more to embroidery or applied ribbon...the flat was more prominent than the 3-D. Here, from the Journal des Dames et des Modes (on Cathy Decker's site), a typical example from 1797. 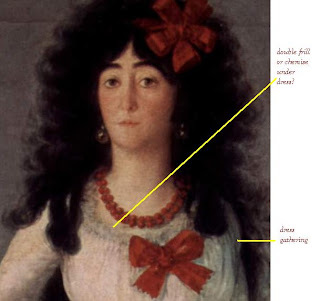 She wears a red kerchief over her shoulders and it appears to be crossed at the waist and tied in back, a common look, but in this case, made to attract attention, not for modesty. Note the wild hat. There was a good bit of experimentation in hats. Many plates and paintings show dresses with significant trains. It's no wonder so many images include women holding their skirts up around their legs, which to my eye looks bulky and silly: can you imagine walking in the muck with a train made of muslin? Not that the woman in the dark round gown with chemise dress-like sleeves below seems to have cared: she was in mourning. 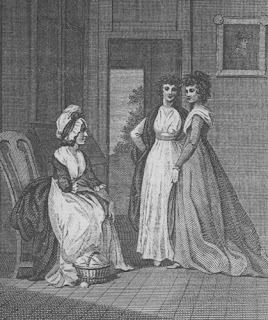 The above from The Lady's Magazine, December 1797 (Cathy Decker's site). Quite a narrow dress. What did paintings and prints show from these last three years? Pretty much what the fashion plates did, but less fussy in the details. Perhaps they didn't show well in paintings, perhaps Grecian simplicity was taken further by artists than by designers of dresses. Portraits are quite public, really, and the sitters want to show themselves with their best feet forward. Perhaps the sitter wants to let the viewer know that they support Egalite and Fraternite in France. Perhaps they want to save their necks. Perhaps they want to let viewers know that they are the very type of the solid American citizen. Perhaps they have hired an artist who is enamoured of the Classical or the republican. Whatever the reason, it's smart to look at more than one medium when trying to get some sense for what was fashionable and worn. 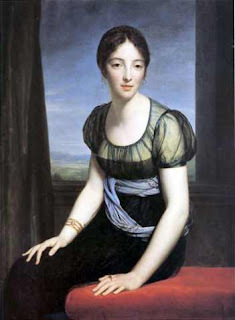 Here is Constance Pipelet, by Jean-Baptiste François Desoria. Posed against an almost Rennaissance landscape and a pure plain blue sky, she sits dressed so severely. Not a touch of anything frilly or girlish; athletic, healthy. A similar simple treatment for Gabrielle Josephine du Pont. A close examination reveals pretty teardrop earrings and perhaps some whitework embroidery on her sleeves, and a silk tie without color, narrow by this point, on her dress. Not all dresses were in white, and not all references were to classical Greece. Here is Madame Regnaud de Saint-Jean d'Angely, painted by Francois Gerard. 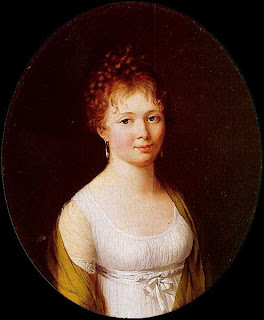 Exhibited at the 1799 Paris Salon, Wikipedia writes of it "Ce portrait un des plus célèbres portraits français, révèle un visage de madone florentine, avec un mélange de douceur et de sensualité qui était la marque de séduction de Mme Regnaud, remarquable par la pureté classique de ses traits" According to my failing memory for French this translates loosely as "this portrait, one of the most celebrated of French portraits, reveals a face like a Florentine Madonna, a mix of sweetness and sensuality which was the mark of seduction of Madame Regnaud, remarkable for the classical purity of her features." Indeed, the dress, as much as the background, does recall some Renaissance treatments...a fashion that we would see occurring more frequently as the Regency progressed, and especially in England. From the Lady's Magazine, a plate entitled "The Admonition". 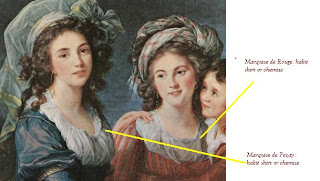 The figure to the left I take to be Mama: she's in a round gown with mob cap and apron and early 1790s kerchief, and one daughter, to the right, is also in a dark-colored round gown and kerchief combination, but with her hair in the closer-to-the-head style . The other daughter? The new style pretty much all the way. Different styles co-existed, depending on one's age, station, and proclivities. And from Isaac Criukshank, two details from a 1799 caricature. In the first, we see "sandal"-wearing with a what might still have been called a round gown, although it was plain as any Grecian-chemise dress. Note the white petticoat! In the second, what looks like cross-over gown worn with lace at the neck, and purple petticoat beneath. You have to look closely at the hem of the dress, which climbs at one side. The overall effect is conservative, more like something out of the earlier part of the decade. Here ends this look at 1790s women's fashion. It hasn't covered everything, not by a long shot, and I could have kept on editing the text for a week of evenings. Had I world enough and time, as they say, I would have visited half the museums in the U.S. and Europe, collected photos of every painting, print and plate I could get, and then categorized the contents of each, from head to toe, creating a massive spreadsheet detailing the appearance, change, and disappearance of elements in dress. Alas, not world enough, or time. So scattershot must do. Any comments or corrections appreciated! In the coming weeks and months, I finish the bodiced petticoat tutorial, and move on to my 1794-95 ensemble, which is evolving not only from the above, but also from an examination of photos and drafts of extant garments, and, I hope, some advice from true professionals in reconstructing them. 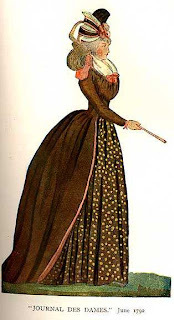 See all my 1790s posts, plus experiments in costuming in 1790s: Costumes. You'll find a lot of research, such as analysis of extant clothing, portraits, portrait miniatures, fashion magazine texts and plates, even translations from the German Luxus und der Moden, and of course secondary sources, that I've done in efforts to document each part of the costumes made. You're welcome! It's been quite a project. Am still researching, at this point focusing on construction, so there is more to come over the next months. I'm researching 1790's...and found this! Thanks for sharing so much great information! A great post. I appreciate your attention to detail!